What does it mean to live in relationship with God? She asked me four questions. Below are my brief meditations on her questions about what it might mean to live in relationship with God. 1. How would you describe your experience/relationship with God? Deep. Wide. Vast. Unceasing. Like a deep, subterranean river flowing always at the core of my being. Of course, I talk with God, but the relationship goes beyond words. God is nearer than the beating of my heart, close as my next breath. God is the Beloved, the Source, Substance, and Goal of All that is. I behold the Divine splendor in every blessed thing—each face, each sound, every flower, bird, and stone. In the taste of wine. In the breeze blowing on the surface of my face. St. Ireneaus once said, "The glory of God is a human being fully alive." My aliveness is my experience of union with the Beloved. 2. Describe the moment in which you took control of your relationship with God? “Took control” is an odd way of putting things when it comes to God. One can never take control any more than one can hold back the crashing of an ocean wave or move the stars. But I have taken responsibility for my relationship—that is, I have awakened. But there is no single moment I can point to. There’s the moment as a 14 year old when I realized there was something greater in the universe that all I see and feel. There’s the moment when Jesus became more than a name for me. There’s the moment I thought I was wise and understood God because I had become a professional theologian. There’s the moment I realized how silly that presumption was. And there’s the moment each day when I yield again the the unseen Presence and allow myself to grow in my awareness of my essential union with that Presence who is both Awe and Delight. 3. How did you go about taking control of that relationship and what was that like for you? When in prayer, I grow still. I become aware of the fire within me, my aliveness, the energy that shimmers in every atom. I slip into the Mystery of the Divine and my union with God. The Christian tradition describes this as “God in Christ and Christ us.” And when I’m in conversation with another, I practice being present; I practice a “deep looking” into their eyes and I behold the presence of the Divine. I realize that there’s no other moment, there’s only this now. And I realize I am alive. Here. Now. Nowhere else. We spend so much time living in our heads—north of the neck—but never really present here, now, in these bodies of ours. I can’t meet God in my thoughts. God is not abstracted into some doctrine. Doctrine, ritual are all derivative—they find their source and goal in the encounter with that which cannot be described or controlled. So, whenever I draw myself into the moment, when I'm present fully, I am with and in God. 4. What do you consider most important when understanding God? That I can't understand God. And I’m so grateful for that. God is infinitely beyond. God is expanding always, along with the always expanding universe. And yet, God is dynamically present, down and in all things. So, God is both transcendent and immanent. Unfortunately the vastness of God, the transcendence of God often takes over in human imagination. And for much of history, this view of God-as-up-and-out has dominated human civilization (especially in the West) and kept people from experiencing the tender presence of the Divine that runs through all creation. Kings, and anyone in power, have promoted the transcendence of God because it justifies hierarchy, and hierarchical structures keep much of society in tiers of oppression and suffering. But God is not separate from nature. God is in and through it. God is. I am. And I am of God. God is everywhere. Up. Down. In. Out. Therefore, all things, all people have a God-breathed dignity that cannot be taken from them. This, I think, is the answer to so much that divides and wounds us on this planet. I recently wrote a poem that reflects this. It's a form of the historic Christian Sanctus that's chanted during the Eucharist or Holy Communion. I sing it myself each morning as I enter prayer and contemplation. It expresses what it means to experience God. light that dwells in all of us. nothing sep’rate from your love. and for You and Your divine dream for the world. Wisdom of God, sit among us. Mischief of God, keep us light-hearted. Help us embrace the gift of this new day. Help us receive the gift of this present moment. of time and eternity intertwined. and taste in this moment Your hope for what is yet to come. Bless the time we share. of Jesus in the world. The prayer of the heart unites us with the GOD who delights in the splendor of the material world. In this often violent and fractured world, beauty often seems scarce. But wherever GOD is, there is beauty. And wherever beauty is, GOD is there. Join us for this conference exploring art, nature, and daily experience as ways to open our hearts to GOD. A handful of local people practice different forms of art--from pottery to poetry, nature films to musical forms. They will offer short, curated presentations, each inviting us to engage our own daily experience, finding the beauty around us as a way to open our hearts to the presence of GOD. For more information--schedule, presenters, and online or snail mail registration instructions click HERE. Space is limited and we expect a sold-out conference, so please register soon. Seriously, this is not a gimmick to get you on board early! Despite the rage over mindfulness these days, I confess I’m a slacker. Sure, I’m all for the focus meditative practices bring into my life. I practice at least twenty minutes of meditation once a day. Sometimes more. I have for years. Meditation centers me, pulls me away from the continual lure of distraction, and helps me train my mind not to follow every thought wherever it wants to take me. Through meditation the cage full of monkeys in my mind grows calm and still—or more calm and more still than it otherwise would be. What’s more, meditation involves me in more than mental health exercises that balance the brain and free my body from many of the stresses of the modern age. Through meditation, I draw my renegade mind down into my heart and become more fully integrated as a human being—rooted in a non-grasping experience of the love of God who gives me a deep sense of belonging, meaning, and empowerment. I wouldn’t likely know all this without this kind of praying. That said, while I practice what many call mindfulness, and I’m grateful for its growing popularity and the broadening of its practice, there are at least two reasons I’m slow to jump on the bandwagon. 1. The term for me is a turn off and, therefore, unhelpful. I don’t know about you, but I don’t want to be full of my mind. I’ve had enough already of all that goes on inside it. I want less of my mind not more. And mindfulness conjures up in my head visions of an oversized brain. Of course, Jon Kabat-Zinn and others will tell me I’m mistaken, and I maybe am. They’ll tell me that mindfulness isn’t about thinking. I get that. But mindfulness is a word like playfulness and joyfulness, awfulness and hatefulness. It is the state of being as full of mind as I might be full of hatred. And I don’t want to be full of my mind. To be fully and authentically and robustly human, I want my mind to find its proper place within me. And I don’t think that place is to fully dominate the rest of me. 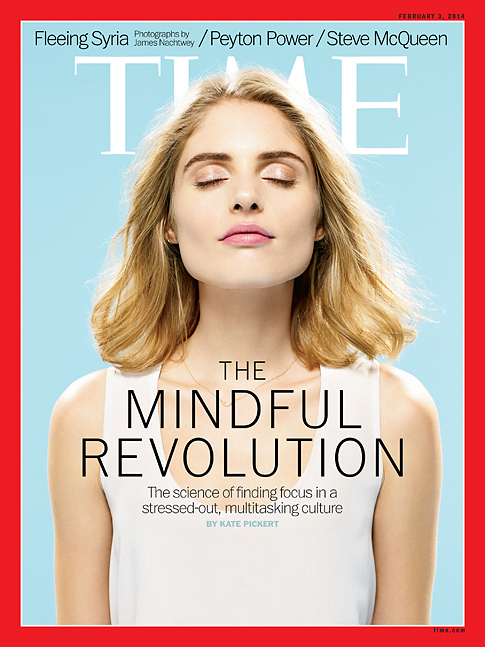 Now of course, I know that’s not what mindfulness practitioners are after. But words matter, and frankly, the word just doesn’t help me to get where mindfulness is supposed to take me. I’d rather experience the presence of mind. That is, I’d like to cultivate a mind that’s more present to my body and my heart (or soul)—a mind that knows and values its place within the larger household of my being. 'till What I seek finds me. Following this prayer, I just sit and bring my full self to full attention before God. Click HERE for an example of this kind of meditative practice. In this way, my body, mind, and heart are drawn together in a unity of surrender and presence before God, and I avoid privileging any one of those parts. I mean no disrespect for those who practice mindfulness and who draw their practices from other religious traditions, but for me the Incarnation of God in Jesus Christ honors the fullness of my humanity—all of me and not only one part. Someone will say I’m splitting hairs over words. But hey, if mindfulness is a useful word for you and helps you find the balanced humanity we're made for, more power to you. But for me, and for a number of others I suspect, it’s a word that doesn’t carry me where I need to go. 2. There are benefits that come to a wandering mind. While there are many benefits that come from mindfulness training—focus, clarity, release from the relentless machinations of the mind’s thinking function, and an increased ability to be present here and now—there's a downside to all this. Current research on mindfulness training shows us that there are real benefits that come from a mind that isn’t so taut, so disciplined, so focused on one thing . . . or no-thing. This doesn’t mean that we want to celebrate distraction. No, distraction’s an epidemic today. And if mindfulness can help heal us of the disease, I’m all for it. But studies show that a mind that is too focused may not have the necessary freedom to wander down the interior paths that can lead us to insight, discovery, and creativity. What this means practically is that the practice of meditation or contemplation—my mind present to the rest of me (that is, in my body and in my little part of the world rather than following my thoughts wherever they wish to carry me)—meditative practice can create an inner space that’s free enough from the relentless distractions of our modern world so that I can allow my mind to graze freely like a horse in an open pasture. Contemplative practices like “mindfulness”, tether the mind, or fence it in, so that it doesn’t wander too far afield. But if the mind is too tightly corralled the mind doesn’t have the freedom to discover new things. So, yes, let's practice the presence of mind—focusing our awareness on the here and now—so that we can heal ourselves of the relentless distractions that pull and claw at us. And then let us let go and let the mind wander with freedom so that our creativity can flourish and we can stumble upon those epiphanies (or let them come to us) that make life interesting. Now begin to follow your breath, in and out. Survey your whole body, beginning with your toes and ending with your nose. Release all tension. Sink into the presence of God. Gently breathe, giving your thoughts the freedom to come and go. Like snowflakes, you may notice them but don’t hold them. Simply let them fall. Letting them fall won’t be easy. Your mind will parade many things in front of you.